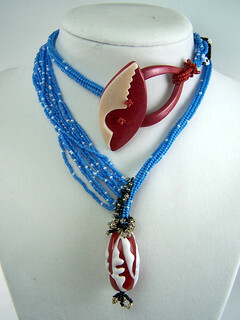 Just this month I discovered an exciting blog called Art Bead Scene. It is devoted to jewelry that features artisan handmade art beads like ceramic pendants, polymer clay beads, and my favorite - not that I'm biased - lampwork. If you follow me on Pinterest, you already know that I have a board devoted to Lampwork Jewelry, so to find a blog devoted to the topic was exciting to me. 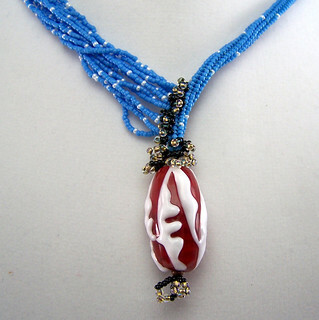 The blog hosts a monthly challenge to use art beads to create a piece of jewelry, which includes random giveaways to participants from various challenge sponsors. So, if you haven't heard of that yet, go check it out! Given that my primary occupation at the moment is keeping an almost-4-year-old out of too much mischief, I'm always excited to find challenges to motivate me to create. So, when I saw this month's challenge I started pondering designs right away. 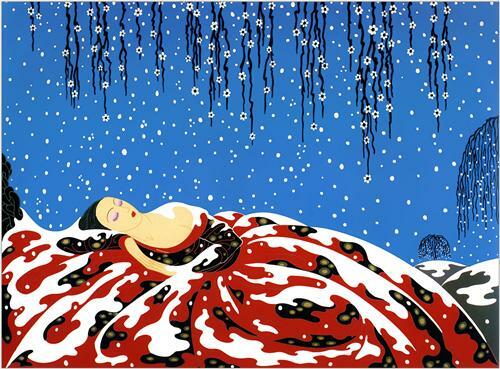 This month's inspiration was Erté's 1983 Serigraph Sleeping Beauty. I was struck right away by the soft blue and white in the sky and snow, and the contrast with the carmine dress on Sleeping Beauty. 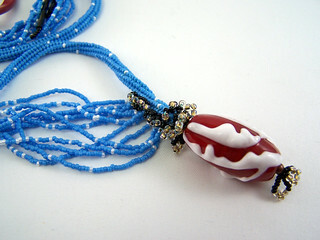 So, I created a lampwork bead with the same red and used some careful stringer work and fill-in to create designs on the bead that reflected the folds and drifts of snow seen on the dress. Since I loved the contrast between the red and blue, I realized I could use beadwork to bring in color and detail to support the focal bead. The main beadwork feature that I envisioned was a blue herringbone rope with irridescent white beads interspersed to represent the falling flakes of snow, if for no other reason than I always feel compelled to have clean lines in my work, even if as only one part of the whole design. Because of some of the organic features of the serigraph, like the floral vines, I thought the design would look too confined if that was the only element I used to support the focal bead. 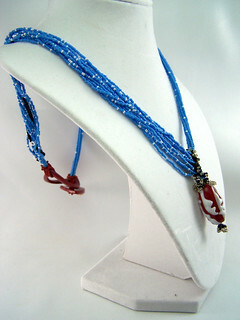 So, to bring in an organic feel I connected individual strings of beads to the main rope. 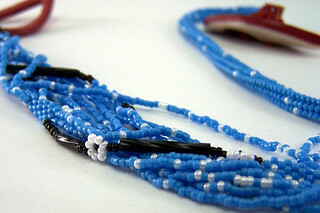 To help cement the organic, viney feel, I occasionally connected the bead strings with peyote stitch. I also used peyote stitch to connect all of the strings together at the end, so I could create a tube and finish the end of that side in the same way as the herringbone rope side. Because I discovered the challenge in mid-December, then with Christmas, I had to hustle to get a clasp that would complement the design I was creating. 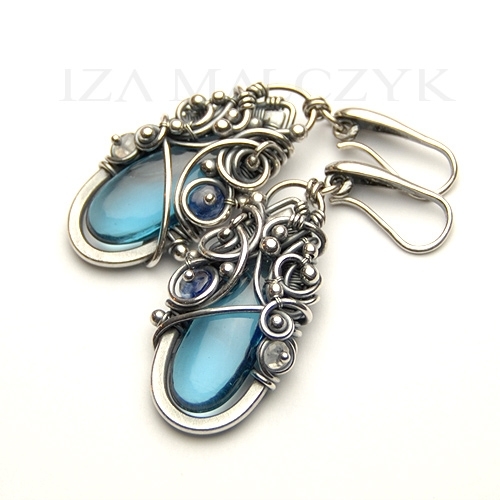 So, I ended up creating a toggle clasp in Polymer clay. 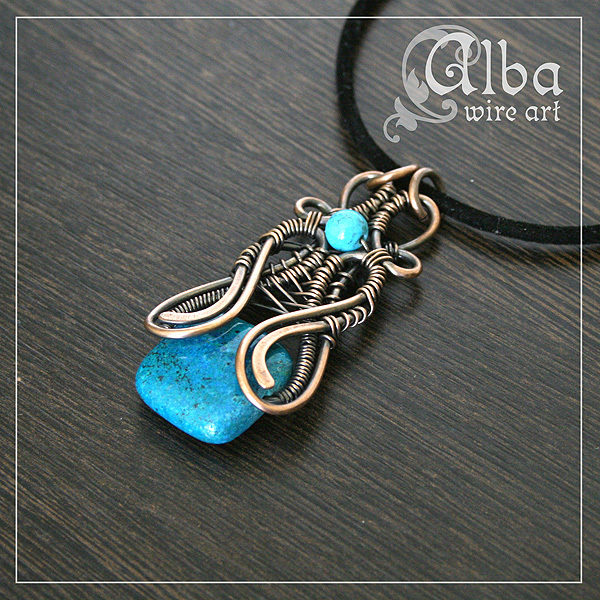 I liked the idea of the leaf shape because it complemented the shape of the focal bead as well as the vines and flowers that were part of the design. In a perfect world I would have created a leaf-shaped lampwork button in the same color with the same white designs. 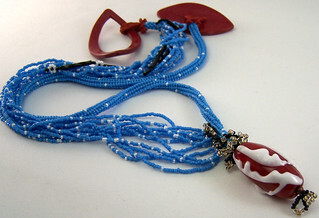 If I do make one, I'll replace the toggle loop with an open 3D peyote 'leaf', ala Marcia DeCoster, in red and white. The finishing details were my main struggle. Though I'm great at imagining a finished piece, I have to play around to get a sense of the details. The first details that I filled in were the small loops I used to connect the focal bead to the rope. Because the area where I connected the bead strands to the main rope looked unfinished, I carried loops up the rope to hide the connection points. The black and gold/brown colors were chosen from the accent colors found in Sleeping Beauty's dress. I think if I were to go back and do touch-ups, I'd add some longer loops to fill in a little better, though at the time I didn't want to overwhelm the blue and red with too much black and brown. The next detail was to do the same looping detail technique to hide the connection points where I attached the red beads that hold the toggle clasp. Finally - and this was the detail that I most wanted to include but was most unsure how to execute, was adding in the vines and flowers. Originally I'd been thinking I'd add those vines to the rope side to make it feel less formal, but the small peyote connections between the bead strands provided the solution in the end. I used those peyote patches as the stages from which I strung the black twist bugle beads and white daisies. In all, while I obviously took liberties, I feel like you can tell this necklace was inspired by this specific piece of art, which is an important part of the challenge for me. I hope you enjoy it! Is it wrong to feel a complex coming on? I'd spend some time trying to explain where I've been (mentally), or what I've been up to (physically), but if you've been on pinterest at all then you already know. It started with the garage-to-studio remodel. The walls are all sheetrocked and painted. The ceiling mostly done. But, by the time I got to that point it was too cold for me to ask people to come and take some classes with me and my propane space heater. So, that bit will have to wait until spring. Just as well. Mentally I've been desperate to better define myself as an artist. Teaching out of stores, as I've done for the last six-and-a-half years, it was up to me to teach how to use what was in the store. Now that I'm taking the time to create my own studio, I feel like (1) I need a little more street cred to pull this off and so I need to start creating some more work, spend some time being productive, making a new masterpiece or two and (2) I really need to contemplate what it is that I want to teach. Right now I don't have a roadmap for my students (except for one young braniac, you know who you are, my padawan) and I feel like I need to be really excited about where I want my students to go ... at least in a more specific way than that it involves more than one kind of torch. Right now I feel like my body of work has been stagnant for too long for me to be excited about any of it. More and more my ADD whispers to me (in an incessant, unignorable, Pee Wee Herman "I-know-you-are-but-what-am-I" kind of way) that I need to broaden my horizons; that I'll get bored if I try to focus on one thing, like sensible people who want to master something would do. In the recesses of my mind I understand that if I don't make things interesting for myself and explore beyond my current horizons I'm more likely to wake up in a rage of hating everything, making mastery of anything a moot point. I've been working hard at getting my beadwork more advanced, my detailed/3D wirewrapping more advanced, my lampworking more advanced, along with experiments with leather, polymer clay, adhesives (though I've eschewed vehmently them in the past), found objects ... all while trying to envision how to bring them together in my own way. Of course, pedagogically, I know that won't happen until I can do all of the above without thinking. And, so I progress through the pedantic, reading tutorials and scanning pinterest to figure out the range of these crafts, what techniques I didn't know about, how to execute them, how to manipulate them, and who I can learn from. So, enter Pinterest. My muse. Oh, how you know the soul of the artist, you siren. Did you know that the former Eastern Bloc is the nexus of the wireworking world? Oh, we have some gifted artists here in the US (e.g. Sarah Thompson and Nicole Hanna), but O.M.G. It's comparable to Germany for lampworkers. Maybe it's the culture that artists in those particular fields in those particular places are somehow incapable of accepting and posting work that is anything less than groundbreaking perfection. Maybe it's that there are some truly gifted and prolific teachers in those places. Perhaps both. But the phenomena doesn't seem to be isolated. 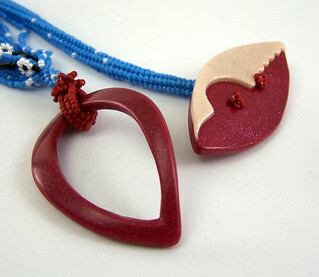 Do you know how many Hungarian sites Google has had to translate for me when I've been researching talented beadweavers? More than any other language, let me tell you. Apparently people went to impressive lengths to do more with less behind the Iron Curtain. I'm on the verge of a serious complex. There's SO much to learn about so many things that I feel Socratic when I say that what I'm really learning is how little I know. Oh, don't you worry. The practical side of me will keep plugging away. I don't let Zeno's Paradox keep me from making progress. What I can say is that, while I've been silent, it's been because I've been truly busy on many fronts and I'm on the threshold of some really new work. I'm excited. For now, I have been trying to put things in my Etsy store, so check in there from time to time. And for anyone that was hoping for fall classes - I apologize, but come the spring I'll have some really exciting things waiting!